There are many ways of implementing fire safety, but it can be said that a good fire door(s) is one of the most important fire safety products on your premises. In the case that a fire does break out, fire doors are an essential way of stopping the fire from spreading. 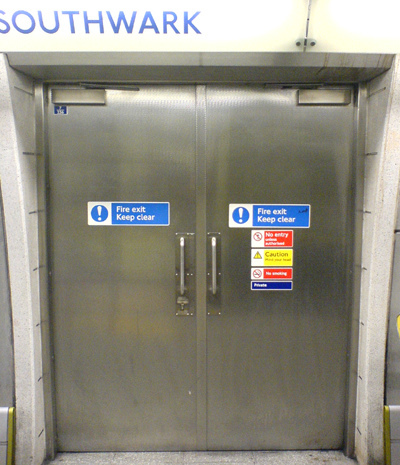 Fire doors have two important functions in a fire; when closed they form a barrier to stop the spread of fire and when opened they provide an escape route. A well-designed timber fire door will save lives by delaying the spread of fire and smoke. • The door itself is usually made from a solid timber, sometimes covered in fire resistant glass. 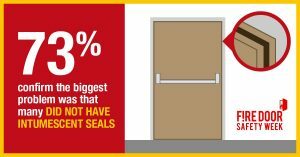 • Fire doors are sealed with intumescent seal, which is designed to swell and expand when subjected to heat. 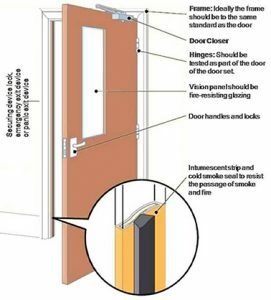 • All elements of a fire door, including everything from locks and hinges to latches and seals must be fire rated. Fire doors can provide up to four hours of protection, although, the most commonly installed fire doors are 45mm thick and provide 30 minutes of protection. The design of a building, the nature of its business and the particular location of the fire door in that building, will all determine the category of fire door required. Fire doors can be seen as an annoyance at times, especially when squeezing through them with whilst carrying heavy goods or with a buggy, however, wedging a fire door open with a fire extinguisher or a heavy-duty door stop is extremely unsafe, bad practice and is illegal. A fire door won’t work unless it’s fitted properly. Use a skilled joiner who has experience working to the official guidelines and ensure you receive certification of this. Ultimately, fire doors are tested against the elements and provide some peace of mind in the event of a fire, keeping you safe until fire fighters arrive. At H Timmins we are fire door installation and maintenance experts, for any fire door queries contact us here. Previous post: Who is responsible for fire safety in the workplace? Next post: Are you ready for Health and Safety at Work Day?